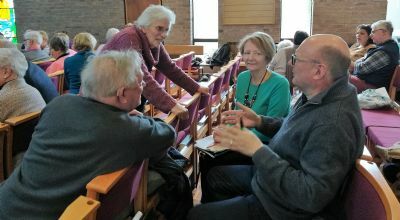 Around 80 people enjoyed an inspiring time at our Synod meeting on Saturday 9 March at Heswall URC. The day began with worship and then Neil Hudson, from the London Institute of Contemporary Christianity, delivered a stimulating talk about being the Elect and In Exile (1 Peter 1), talking about the tension of living counter-culturally. Neil also explained about “every contact leaving a trace” and to remember that, wherever you go, you are Jesus’ representative. He mentioned the One Degree Shift, where you can change just a small thing and make a difference, giving the example of a lady going to the same supermarket checkout lane each time and developing conversations with the same checkout operator. If you want a reminder of the session, view Neil's slides. Reports were made from communications, safeguarding, children and youth work, and church and society, as well as other business being discussed. Please do come to one of our summer Synod meetings – we’d love to see you there!